The LDS Church has had a rough month. It started with the March 25th outreach effort of Christians across the nation distributing thousands of DVDs on doorsteps which compared Mormonism with the Bible. Soon after that, the Church released a statement of their concern over the content of an upcoming PBS series titled “The Mormons” due to air on April 30th and May 1st. 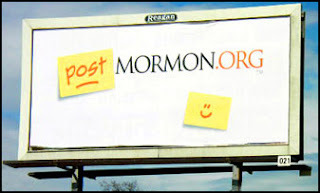 Now, in Logan, Utah, a new billboard has gone up which advertises a web site in support of disaffected Mormons. Ricks, who left the church in 1993, said Post-Mormon Community serves as a social network. The goal is to erase the stigma that sometimes comes with leaving the faith. …members of a rapidly growing community of families and individuals who have voluntarily left Mormonism. We choose to no longer base our lives, and the lives of our children, on so-called truths dictated by others. We believe that truth is freely available to any honest, diligent seeker regardless of creed, age, race or sexual orientation. We have felt the butterfly’s metamorphosis. Forces that well up from within have compelled us to grow beyond the limits of Mormonism. And so we have become a loosely knit community of friends and support groups, and endeavor to help those like us who also feel the need to explore meaning, purpose and life beyond Mormonism…What we once perceived as the “strait and narrow way” has broadened to include all ways that promote individual and collective well-being. We are not anti-Mormon; it is not our intent to belittle others. In fact, we want to keep all the good that came into our lives through Mormonism, but we will be open about its misrepresentations and the way in which its dogmatism and authoritarianism have proven detrimental to many individuals, families and communities. We do not advocate another form of Mormonism or any other religion and believe that loving one’s neighbor begins with giving up the claim to have special access to truth. We feel that arrogance attends the illusion of “knowing the truth” and that such arrogance leads to a narrow-minded tribalism that impedes personal growth and fosters a divided community. It’s unfortunate that PostMormon.org, dedicated to helping people find joy in life after leaving a religion whose “dogmatism” was “detrimental,” would embrace such an idea. If a member of the Post-Mormon Community continues his spiritual journey and eventually comes to believe he knows the truth, will he be labeled “arrogant” and be thought to be on the road to “narrow-minded tribalism that impedes personal growth”? How is this an improvement over Mormon “authoritarianism”? I love the idea of available support for people struggling with the problems they encounter in questioning or leaving Mormonism, but PostMormon.org seems to be throwing the baby out with the bath water. Truth is freely available to all; yet the ability to know the truth is not an illusion. By embracing this ideology PostMormon.org is merely replacing one deception with another. Jesus, who claimed to know the truth, said, “the truth will set you free.” I believe Him. The only hope for Mormons, Post-Mormons and non-Mormons is the Truth: Jesus, the way, the truth, and the life. That is one of the biggest issues in witnessing to mormons. It is pretty easy to knock their faith out from under them, but unless we are willing to show them not just why mormonism is wrong but also with Christianity is right, we are not carrying out our Biblical mandate. When I was in the membership area of the bishopric, I recall that of members on the rolls, half of them never attended. It was not because they were going to a Christian church, it was because they were turned off on religion in general. I know that feeling well having come out of mormonism, the fool me once shame on you, fool me twice shame on me attitude. Sharon please don’t discount the value of this organization. I have read the stories of many who try to leave and this type of support may be just what they need to take the plunge. Part of the process of leaving Mormonism is learning to trust ourselves. I left over 20 years ago and spent the next 15 years in the process of investigation and study. I remained agnostic until I finally came to a place where I could trust myself to investigate religions. Post Mormon groups, psychologists, or loving friendships can be supportive of this process and can aid our ability to protect ourselves from deception in the future. The experience of being a Mormon can make one leery of any religion. There are times when we must go through a non-religious transition in order to trust Christ. Thank you for your perspective on the Post-Mormon Community. By my comments I didn’t mean to dismiss the value of the group. I know there are many Mormons in spiritual transition who need a safe place to share their experiences and to heal — without pressure to immediately jump into another faith. My comments should instead reflect my…disappointment. I would prefer to see the Post-Mormon Community remain neutral on whether people have the ability to know truth rather than taking the position that knowing truth is but an illusion. As I’ve thought more about this I’ve wondered if the statement on the PostMormon.org web site is not intended to be as broad as I’ve taken it to be. Maybe the Post-Mormon Community has taken this position in direct response to the LDS system they have left — their previous testimonies of “knowing” something was true that they have since discovered was not true at all. Given that, it’s an entirely natural response to want to keep so-called truth at arms’ length. I have posted every now and then on Post-mormon.org I feel they are everything but supportive. I left mormonism 5 years ago, after a brutal divorce. while I went to Post-mormon.org for love and understaning, andf maybe even a little healing. I got everything but. I am now a mainstream christian. Not someone very accepted on the postmormon board. So I would say unless you do not beleive in God; you will not have a great experience there.